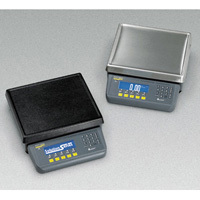 A bench scale with Quartzell digital accuracy, custom programmability and clear, high contrast display capable of graphics and multi-sized text. Capacities of 10 to 100 lbs. The Table Top 830 links Quartzell precision with a completely programmable instrument. This scale has a clear, high contrast display capable of graphics and multi-sized text. Quartzell accuracy - Pure digital signal. No analog components to slow, corrupt or interfere with weight sensing. Custom programming - Programming that fits each customerâ€™s scale process is created and downloaded by a local distributor. Operator prompts - Clear operator prompts simplifies training through a specific process. "Soft keys" - The indicator's five programmable soft keys let operators move quickly between functions, which speeds processing and personalizes the scale to the specific need of the operation. Dimensions - Platform: 12" x 14" (50 and 100lb models); Platform: 8.5" dia. (10lb models); Overall 14" x 17" x 4.5"